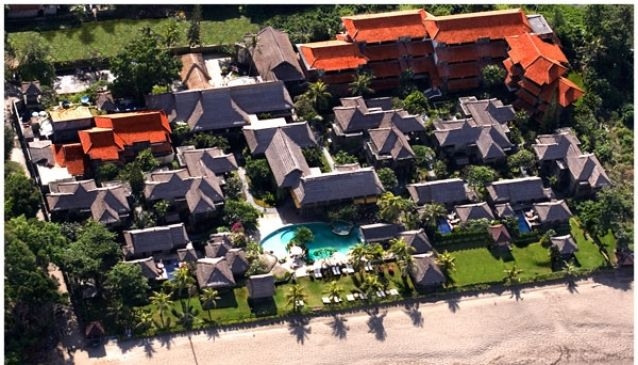 Grand Balisani Suites is situated directly onto Batubelig Beach with excellent sea views, magnificent sunset views from the sunken bar and an open air Kamboja Restaurant overlooking the vast panoramic Indian Ocean. Furnished with luxurious modern Balinese style décor, Grand Balisani features total of 96 rooms-accommodation starting from 3 Sani Villa (Two Bedroom Villas with Private Plunge Pool), 26 Garden Suites with Garden View and Sea View, 7 Deluxe Sea View and 57 Deluxe Garden View. Facilities: Lobby Lounge, Free Form Swimming Pool, Health & Spa Centre, arts and souvenir shops. Only 13 km from Ngurah Rai International Airport , and less than 2 km from Seminyak, the latest buzz in Bali, offering dynamic lifestyle trends in restaurants and boutiques. Whole streets feature some of the top hip and famous places to hang out, nightclubs and world class international restaurants from fine dining to leisure eateries.